TN Forest Department Recruitment 2018 2019 | TNFUSRC invites Online Application for the post of 1178 Forester, Forest Guard, Forest Guard with Driving License Posts. 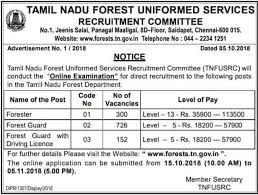 TNFUSRC Forest Guard, Forester Jobs Notification 2018 Released. TNFUSRC invites on-line applications for appointment in following Forest Guard, Forester post in Tamil Nadu Forest Uniformed Services Recruitment Committee. Opening Date and time for Submission of Application is 15.10.2018 and end up by 05.11.2018. You can check here TNFUSRC Recruitment Eligibility Criteria, Pay Scale, Application Fee/Exam Fee, TNFUSRC Selection Process, How to apply, TNFUSRC Syllabus, TNFUSRC Question Paper, TNFUSRC Admit Date Release Date, TNFUSRC Exam Date, TNFUSRC Result Release Date & other rules are given below... Aspirants are requested to go through the latest TNFUSRC job recruitment 2018 fully, before applying to this job. As per the recent TNFUSRC notification 2018, the eligibility details like Educational Qualification & Age Limit for the Forest Guard, Forester job has given below. A pass in Higher Secondary Course with Physics, Chemistry, Biology, Zoology (or) Botany as one of the subjects. 1) A pass in Higher Secondary Course with Physics, Chemistry, Biology, Zoology (or) Botany as one of the subjects. 2) Must Possess a valid driving licence issued by the competent Transport Authority of the Government of Tamil Nadu. 3) Must Possess a certificate from a reputed firm or company to the effect that the candidate possess experience in driving motor vehicles for a period of not less than 3 years after obtaining the driving licence. 4) Must possess elementary knowledge of general mechanism of automobiles. 5) Must possess a first aid certificate. 6) Must possess a clear eye-sight. TNFUSRC may follow the following process to select the candidates. How to apply TNFUSRC Forest Guard, Forester Vacancy?